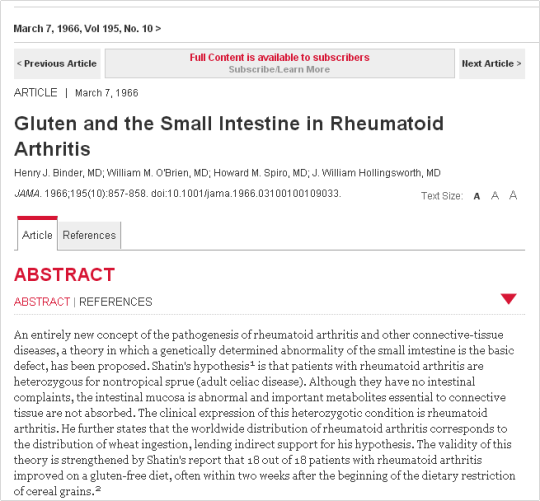 A couple of days ago, Josh Gitalis, a former teacher I had at my nutrition school, shared an image of a research article from 1966 where 18 of 18 patients with rheumatoid arthritis had improved symptoms on a gluten free diet. I immediately posted it to my Facebook page. I already knew there was a connection between gluten and other diseases but I think I had forgotten the possible extent, and since so many people suffer from some of Celiac disease’s secondary illnesses, I figured this post could be useful. Now, rather than just list off any and every possible connection with the disease, I am going to start with explaining HOW these conditions link to a gluten intolerance or Celiac disease. As an FYI I’m going to use gluten intolerance and Celiac disease interchangeably from this point on as both conditions involve gluten bothering the person. In an ideal world, the antibodies can tell the difference between an invader and the body’s own tissues; however occasionally, the molecules look similar, and the body mistakes its own proteins/tissues as an invader and attacks itself. This, my friends, is an autoimmune disease. When the attack happens in a localized area, it can breed various conditions. For example, in the joints, the result is inflammation and pain called Rheumatoid Arthritis. In the bronchials, it is asthma; in the thyroid, Graves disease or Hashimoto’s. So where is the connection to gluten? Well, the best way to HEAL an autoimmune disease or at least keep it at bay is to HEAL and strengthen the gut lining so that undigested particles aren’t passing through it and causing an immune response. However, since gluten is something that so many people have a hard time digesting, it can continue to damage the gut lining, making it impossible for it to HEAL.